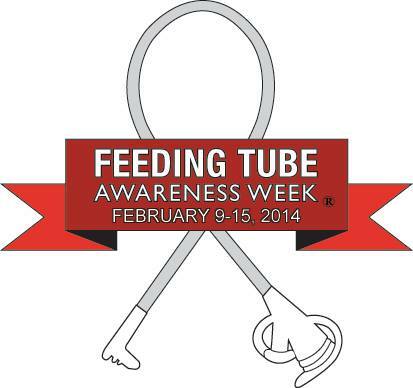 Feeding Tube Awareness Week 2014! Day 1: Share your Feeding Tube Awareness Week video and story. We did not make our own video this year, but we were a part of the video created by The Oley Foundation which celebrates people of all ages with feeding tubes! The theme for this year’s FTA Week is “Nothing Can Hold Us Back” which is clearly evident in this video. Enjoy! Most of you know our story, but if you are new, the short version is that Braxton aspirated at birth so it was not safe for him to breast or bottle feed. Aspirating means that you are swallowing fluid in to your lungs instead of your stomach. Braxton also had very poor coordination and low muscle tone in his face so he simply could not eat enough to sustain his weight. At 2 weeks old, Braxton had surgery to have his G-Tube placed. He quickly began to thrive and finally was sent home from the NICU the next week. We have worked very diligently with our Speech Therapist on feeding and we are just now, at 2 and a half years old, seeing real success. Braxton is eating pretty much all of his food by mouth now and we are only using his tube to give him water to keep him hydrated and supplementing his feeds just to make sure he is getting the calories he needs to maintain his weight and gain appropriately. For more information you can read our post from Day 1 of FTA Week 2013 or get the full scoop on the Day Braxton Became a Super Tubie. Day 2: Share your tips for feeding on the go or in public! The best tip is: your kid HAS to eat no matter where you are so don’t be afraid to pull out your tube and feed your child! We were so scared in the beginning about what people might think of us or Braxton when they saw us using the feeding tube. Would they think he was chronically ill or contagious? Would they think we were bad parents? That we MUST have done something for our child to be this way? It took a while for us to be comfortable with public tube feeding, but now it is really no big deal. We have fed in restaurants, in doctors offices, while on a road trip in the car, at the park, anywhere! We always made sure we had the supplies we needed and we kept a few extra in the car, just in case! We were given a backpack from our medical supply company when Braxton first had his tube and required a pump. It was easy for us to set up the feed and just go about our business. We could go to the mall or the zoo and his backpack would hang on the stroller as the pump ran. In the beginning, Braxton’s feedings were about an hour long and eventually decreased to about 20 minutes. If we were going to be out long enough for two feedings, we kept the 2nd feed cool in a lunchbox or lunchbag with an ice pack. We bought a portable bottle warmer for the car so that we could heat his food up on-the-go. Many times, we would arrive at a restaurant and ask them to bring us a cup half-full of hot water and we simply placed the bottle in the cup to heat up. Always plan ahead. Think about where you are going and what you will need. An extra syringe? An icepack? An extra feeding bag? A change of clothes just in case the food doesn’t stay down? Make a checklist if needed, but eventually, you learn exactly what you need! Day 3: Show how tube feeders can do what they love to do. This was another thing I was worried about when we first got our feeding tube. I wasn’t sure exactly how this might affect Braxton’s development. I remember asking the doctor if he would be able to learn to crawl or have ‘tummy time’ since his tube was right in his abdomen. The doctor assured us that it would not be a problem, and it surely wasn’t! Braxton didn’t crawl until he was about 15 months old, but once he figured that out there was no stopping him! Braxton quickly began crawling lightning fast. One minute he was in the living room and the next he was in the kitchen pulling tupperware out of the cabinets. We also worried about bathing and swimming. I asked if we needed to cover his tube every time he bathed or avoid the swimming pool. Again, the doctors assured us that he would be just fine. So far, Braxton has not been limited in any way because of his tube. He is thriving! Here are some pictures of Braxton just being a regular kid! I can escape now! Go, car, go! Day 4: Share how you and your family cope with the challenges of life with a feeding tube. What has made the journey easier? Support! We became involved with a local support group and met other families whose children are also tube fed. Seeing and truly understanding that we weren’t alone was a big help to us. Connecting with virtual support was also helpful. 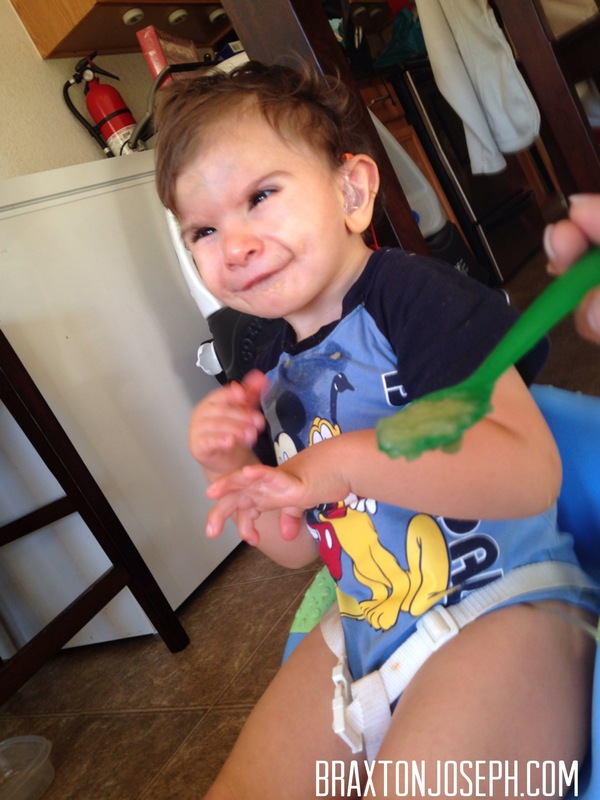 Groups like the Feeding Tube Awareness Foundation really helped us understand that we were not the only family with a child who needed a feeding tube. We have really learned to love and appreciate the tube for a number of reasons. When Braxton would get sick often, we didn’t have to worry about him dehydrating or not eating because we could simply feed him with his tube and adjust the speed as needed. Using the tube for medicine has also been helpful, because making a child take medicine by mouth is no simple task! As we learned more and met others the ‘stigma’ went away. Now, Braxton’s tube is as much a part of him as any of his limbs! At the end of the day, the tube kept Braxton alive and we are forever grateful for that. Day 5: What are your tube feeding hopes and dreams for you or your child in 2014? Well, of course, we hope this is the year we have a tubie graduate! Yes, we are thankful for his tube and we have learned to appreciate it, we would love for Braxton not to depend on it so much. He has recently made some really amazing progress eating by mouth and we are so excited! The next step is getting Braxton to drink by mouth. We are working on straw drinking from a cup and so far Braxton is doing well. He has drank up to an ounce of water in therapy taking small sips from a honey bear type sippy cup. I tried some apple juice and Braxton was not a fan! We will need to work on flavors and temperatures before we can get graduate from the tube. I’m very happy with the success Braxton has made and cannot wait to see what he accomplishes this year! Day 6: Share the tubie love! Share pictures of you or your child living life to the fullest. Today is about living and loving life. This one is easy. Just glance through any of our photos on our Facebook page and you will see that nothing holds this kid back! Braxton is so full of life and love and happiness. His joy simply pours out of him and into the lives of others. Aileen loves her brother without limits. I love the way she loves him. Day 7: Share your favorite Feeding Tube Awareness Week post, photo or video. I think I just did! I was not able to keep up with the daily topics this year, but I think this “catch up” post is perfect for FTA Week. This captures all of the incredible things Braxton has been able to accomplish because of his tube and shares our story. Thank you to all of the people who shared our photos throughout the week and our posts from last year. We are looking forward to an awesome year! Simply click to vote! It’s THAT easy. Then, feel free to browse some other really great mommy blogs. Thank you!